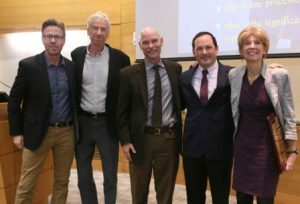 Colleagues of Vivien Casagrande, Ph.D., celebrated her distinguished career in the visual sciences with a “Lifetime of Vision” symposium Nov. 18 in Biological Sciences/Medical Research Building III. Casagrande, who joined the Vanderbilt University faculty in 1975, is professor of Cell & Developmental Biology, Ophthalmology and Visual Sciences and Psychology and a Vanderbilt Kennedy Center investigator. Her studies, which have mapped the visual brain circuitry in a variety of species, have advanced understanding of the development and evolution of the mammalian visual system. A fellow of the American Association for the Advancement of Science and the American Association of Anatomists, Casagrande has received a Chancellor’s Award for her research and an Outstanding Teacher award from the Vanderbilt Brain Institute.